Limited deluxe edition of 500 copies in gatefold sleeve with all instrumentals. 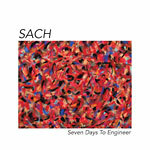 Finally ''Seven Days To Engineer'' gets a proper vinyl release through hhv.de. The entire project was made in 7 days back in 1998 and marked the first solo joint by one half of the legendary Westcoast crew The Nonce. 2 tracks with Yusef are included as well as features by Aceyalone and The Oracle Jayne Doe.